A new Heatherwick Studio-designed shopping and restaurant district near King’s Cross station, Coal Drops Yard opened last autumn with its first wave of restaurants and trendy retail stores. Originally established in 1850, to handle to eight million tonnes of coal delivered to the capital each year, Coal Drops Yard’s most recent redevelopment sees a parade of Victorian buildings and arches reimagined to home various enterprises. Located in canal-side arches fronting on to cobbled courtyards within the original ‘coal drops’ themselves, restaurants and bars include the likes of Coal Office, hicce, and a cluster of Harts Group sites including Casa Pastor, Plaza Pastor, The Drop and London’s fourth Barrafina. Opening next month, Parrillan will join Barrafina as the Harts Group’s final Coal Drops Yard opening, supplying guests with their own mini charcoal grills (parrillas) in order to cook select cuts of meat, fish and vegetables themselves, at the table. 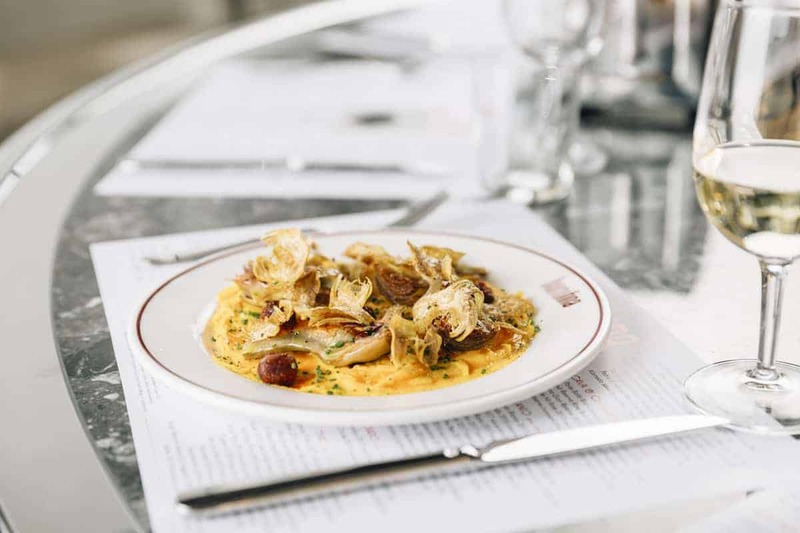 Like the other Barrafina outposts in Soho and Covent Garden, the Coal Drops Yard restaurant has a strict no reservations policy. On the first floor, above Casa Pastor, the new restaurant is the group’s largest, however, with space for 40 – thus making it easier to snag a seat at the counter, particularly at lunch time. The black and white marble counter is also the place to be at this new restaurant – though a couple of tables are also on hand – with natural light flooding the space during the day (even when its raining), making the marble glisten. Sat on one of the 34 red leather bar stools, guests have a front row seat of the open kitchen where chefs and waiters zealously make recommendations from the extensive, Catalan-inspired menu devised by executive head chef Angel Zapata Martin, as well as explaining dishes and ingredients – many of which are listed in Spanish. A daily-changing specials board is also prominent and is enthusiastically read out, dishes described. As is perhaps to be expected, it’s easy to over-order, with so many treats on offer, ultimately accumulating a substantial bill. The key, in this instance, is pacing. Sitting at the counter makes this a little simpler: order a small amount of dishes at first, which can easily be added to as the meal progresses. A recent lunch began with a round of pan con tomate (£4 each), featuring spryly chewy bread rubbed with a healthy amount of raw garlic, crowned with vibrant red tomato seasoned with olive oil and chives: a superlative example of the Spanish classic. From the specials board, Portobello mushroom croquetas (£7) were bite-sized spheres of mushroom hunks and molten cheese which insalubriously coated the mouth, cloaked with panko breadcrumbs and plunged into seething hot oil. Also magnificent. An empanadilla (£9.80), on the other hand, featured thin pastry which concealed a tangle of slow-cooked suckling pig, enlivened by a rich, gouty sauce of prune and port. New to the Coal Drops Yard site, Barrafina’s artichoke and sobrasada ‘la ciegra’ (£11) doesn’t ooze carnally like the original tortilla, but it’s served open and festooned with crispy artichoke hearts and gently spiced sobrasada, each delivering an interplay of contrasting textures which complement the egg. Featuring a parade of ingredients and processes, cured monkfish (£14.50) was another highlight. 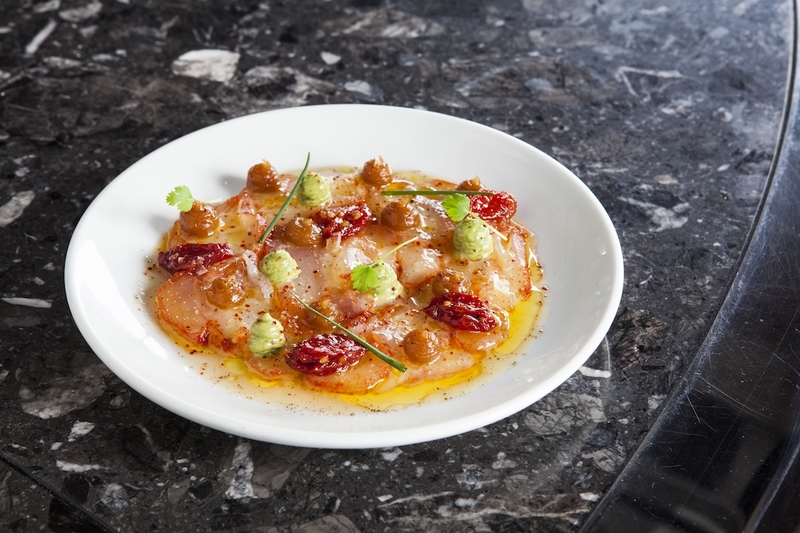 Cured in fino, salt, sugar and paprika, slivers of meaty fish were embellished with confit cherry tomatoes, plus blobs of both avocado mousse and date puree, contributing to a bold chasm of flavours. Two main-sized dishes were chosen from the specials board. Using older Agnei Ibérico lambs from the Spanish Pyrenees, churrasco ribs (£16.80) were grilled and glazed, boasting intense depth of flavour simply paired with colourful slivers of roasted peppers. Elsewhere, a fillet of gurnard (£14.80) was faultlessly cooked, served with plump mussels and potatoes which swam in gluggable suquet – a Catalan fish stew – rife with tomato, garlic, sherry and saffron: the jewel in the dish’s proverbial crown, demanding to be mopped up with an order of additional bread. To finish, Spanish rosquillas (£4) were mercifully light – dougnuts made with fennel seeds and a whisper of citrus zest which counters much of the rich oiliness: a modest, nonetheless remarkable finale. While Barrafina’s Coal Drops Yard site perhaps lacks some of the charm synonymous with the previous restaurants, the food is often outstanding, rendering the space an invaluable addition to King’s Cross’ new metropolitan playground. Barrafina Coal Drops Yard can be found at Bagley Walk, London, N1C 4AB.